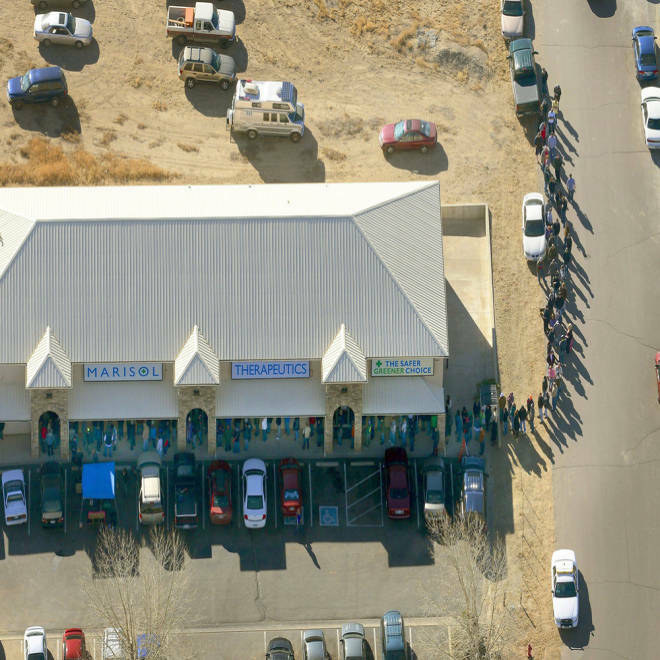 A long line of buyers trails from a store selling marijuana in Pueblo West, Colo., on Wednesday. The high times in Colorado are coming with high costs for cannabis consumers. Hemp hunters who waited for hours early Wednesday to be among the first to legally purchase marijuana from state retailers found sticker shock at cash registers. On the first day of legal weed sales, Gillette said she found retailers selling top-shelf marijuana to recreational users at prices close to $400 per ounce, not including taxes. For comparison, medical marijuana users, who’ve been able to buy weed from Colorado dispensaries since 2010, are currently paying around $250 an ounce plus taxes, she said. The state does not impose any pricing structure for pot purveyors, leaving the market open to supply and demand. One dispensary was selling high-quality marijuana on Wednesday at $70 for one-eighth of an ounce — a markup from $25 for the same amount the day before, according to The Associated Press. But Gillette and other observers keeping careful tabs on the landmark law say they expect costs to eventually stabilize, although it won’t happen overnight. Colorado residents, purchasing marijuana legally for the first time on Jan. 1, reveal how they plan to enjoy permissible pot smoking. But Gillette said she’d still like to see the “high tax rates” associated with marijuana sales addressed by state lawmakers. Colorado State Rep. Jonathan Singer, who sponsored the House bill on legal marijuana sales, said he doesn't want to see the 10 percent special sales tax added to each transaction changed just yet. The state won't know how much those taxes will provide to Colorado's coffers for at least another month. A Colorado State University report released last April forecasts retail prices settling at around $185 per ounce. Colorado residents can buy no more than an ounce per transaction, while out-of-state tokers can purchase up to a quarter-ounce. Phyllis Resnick, lead economist at Colorado State’s Colorado Futures Center, said she also expects prices to lower. “My sense is that competition will eventually arise … and costs will fall below what the black market wants,” she said. Medical marijuana users, meanwhile, shouldn’t be affected by a ramp up in prices or long lines, said Mason Tvert, spokesman for the Marijuana Policy Project, which advocates for medical marijuana bills. Medical marijuana sales aren’t subject to the special sales tax and similar local taxes that drive up costs to the general public. In addition, there are dispensaries that are dedicated to medical marijuana sales only, so patients won’t have to wait hours for service. On the recreational side, the anticipated opening of more pot stores would ease demand in the coming months. While only about three-dozen retailers around Colorado opened to adults aged 21 and older on Wednesday, the state has actually approved 348 retail licenses. Many outlets have been slowed down because they also have to get permission from their local municipality. Prices could also be affected on the supply side by the fact that Colorado allows people to grow at home (up to six plants per adult), and there currently is no cap on how much total marijuana can be produced statewide. As for any demand driven by out-of-towners, Resnick believes the idea of a booming pot tourism industry won’t be a lasting one. Officials in neighboring states, however, aren’t so sure Colorado's weed won't be giving their residents contact highs. The Albany County Sheriff's Office in Wyoming said they have already seen an uptick in marijuana possession after medical marijuana became legalized in Colorado. They're expecting a similar rise again. Sheriff Dave O'Malley told NBC affiliate KUSA-TV that the incident reports reveal how people are unabashedly getting blitzed in his county — which borders Colorado.